Why 'Prometheus' Went Flat : 13.7: Cosmos And Culture Films like the Matrix or even Scott's cyber-punk epic Blade Runner changed were instant classic because they created entirely new textures for serious questions to explored in public while still blowing enough stuff up to keep the public engaged. Logan Marshall-Green (left), Noomi Rapace and Michael Fassbender in Prometheus. I like science fiction as much as the next guy. No, strike that. I like science fiction way more than the next guy. I especially like science fiction that combines big ideas, smart writing and exploding spaceships. 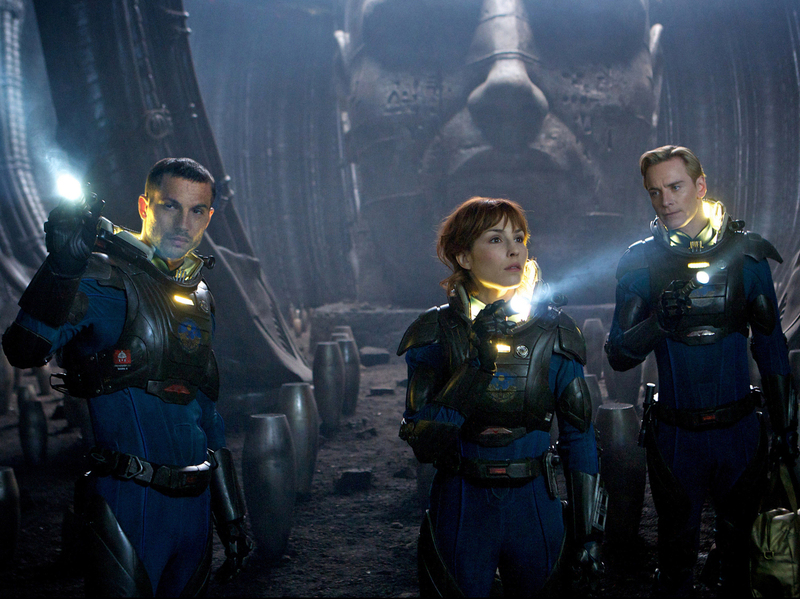 So why did I find Prometheus — Ridley Scott's semi-prequel to Alien — so flat? It wasn't for lack of big ideas. Prometheus had that in spades, with its conceit that humanity's origins lay in ancient (and very large) astronauts. It wasn't for lack of exploding space-ships. Prometheus had lots of those too and a few exploding bodies. It was the smart writing, or lack of it, that did the movie in for me. So many times characters said, or did, dumb things. My suspension of disbelief fell to pieces. A trained biologist treating a newly discovered (and rather evil looking) species like cuddly puppy? C'mon. A character announces that she she can't have children just before she's impregnated with alien spawn? Do I really need to be hit over the head with plot points? Films like The Matrix, or even Scott's cyber-punk epic Blade Runner, were instant classic because they created entirely new settings for serious questions to be explored in public, while still blowing enough stuff up to keep the public engaged. Prometheus however just went back to treating us like children and expected we wouldn't notice. Somehow Scott forgot that the most important part of any story — the story itself — has to come first or the Big Ideas get lost in the explosions.